…and invitations to parties that shook the neighbouring houses and sent flocks of bats screaming into the night. …while others were terse, enigmatic, and even a little sinister. He’d also been forced to grapple with an affair of the heart of his own. He’d been attending a luncheon at the Continental Hotel in aid of the Recently Deceased Trust, engaged in a discussion of Gothic literature and municipal morbidity rates, when he heard, very close, a gasp and a clatter of crockery. Turning, his eyes met those of a white-haired, spinsterish woman, heavily wrapped in Shetland knitwear, who reached for his hand and cried “Graeme! Is it really you!” Good heavens. It was Clara Cordite. He hadn’t seen her since his student days; she’d been the daughter of the chief examiner, and the beauty of their social set. He’d stepped out with her once or twice, before he’d completed his studies and circumstance had taken him off abroad. She was telling him all her own adventures – she had been engaged to the son of a baronet, who had been a scholarly sort and a keen naturalist; he had disappeared while conducting research on river fauna in the Yorkshire Dales, and she’d been heartbroken ever since. She’d often thought of her dear Graeme Taupe-Wainscot in the years since, especially since London had been so cut off from the rest of the world, and was overjoyed to see him again. She was holding him uncomfortably closely now, and her declarations of revitalised affection were beginning to draw amused attention. He could not let the lady upset herself so; he had dedicated his life to medicine, after all, and had no time for more sentimental pursuits. That had been the most distressing event of the holiday, except for a series of unusual dreams that had begun the night he had spent carousing with the dressmaker and the diplomat. They had begun innocuously – strolling on a sunlit lawn, watching the wildlife frolicking in the bushes – but had grown stranger and stranger, until they reached their apex on the last night of the Feast. He’d shot bolt awake, struggling against a pinion of tangled sheets, and was horrified to see before him a contorted face, gasping for breath beneath an all-enveloping rain. His horror was little relieved as, on sitting up, he realised that this was his hostess, considerably surprised to have had a bowl of porridge upset over her by the doctor’s sudden spasms. Following a welter of apologies and the fetching of the washstand towel, she explained that she’d thought be might enjoy taking his breakfast in bed, and was about to wake him when he began shouting in his sleep – something ecclesiastical in tone, about the Judgements of the Shames and the burrows of foxes, and she hoped something he’d eaten hasn’t disagreed with him, and she’d be happy to wash his nightshirt for him, and she used to suffer terribly from sleepwalking herself, and go wandering about the house, not knowing what she was doing. Once he’d cleaned up as best he could, he dressed and descended to find the morning post already collected, and the maid preparing a replacement meal. Awaiting his inspection on the hall table were four parcels and a small bundle of correspondence, which he took into the parlour to investigate. The parcels could be anything… and he didn’t feel like surprises just yet, after his unsettled sleep. The letters first. On top of the pile was a card, which proved remarkably difficult to read. Good heavens; like something out of The Three Musketeers. Did people in this city often make medical appointments in advance of injuries they expected to suffer? He put a knot in his handkerchief to remember to stock up on dressings and surgical thread – like it or not, if this individual did call on him in such a state, it was his duty to attend to their wounds. Next was an envelope which bore a short, neat letter. This was a very handsome proposition – he imagined that London may have fallen behind the more up-to-date medical methods of the Surface, and he’d certainly found it difficult to source necessary supplies at anything approaching a reasonable price. He placed this letter aside for further consideration, and picked up the next – a brief, friendly note in an unknown hand. What an informal way of writing the youth of today had – but, the intention was well-meant, and he appreciated it. Behind this note was a string of paper scraps held together by a large clothespin, which were, he realised, the rat-maniac’s daily contribution. The author was in fine form today – their ravings were d-mn near unreadable. The last of these was torn in two, and he discovered its second part gummed to one of the packages – a large, well-wrapped parcel, quite unlike the usual crates. 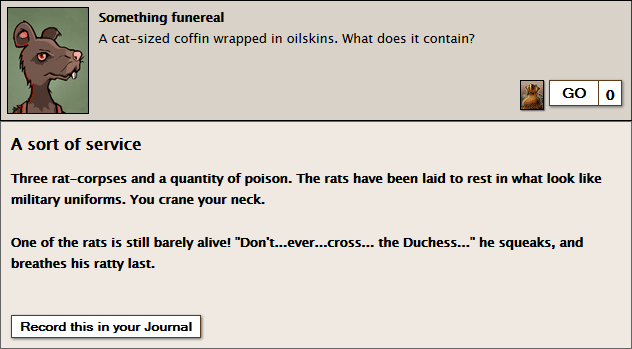 “I hope you enjoyed the Feast of the Exceptional Rats,” it said, “this could be rats. or not.” He ought to be disgusted, but he was surprised at his own coolness. Perhaps it was only resigned irritation, or perhaps he was becoming inured to the queerness of the Neath. In any case, there was no sense in delaying it – he fetched a pen-knife and cut the wrappings away. Inside was a bundle of mismatched scraps of paper – cuttings from theatrical reviews; a torn page from a police notebook; what looked like a training schedule from a boxing club… good lord. There were some blackmailing letters, too, not unlike the one he’d been sent – all the details had been excised with black ink, but enough remained to get a sense of the form. With such a collection of this, one felt one had a sense of the seamier side of city life. He replaced them in their box, and made another knot in his handkerchief to remember to lock them in his writing-desk. The final package was adorned with a card, bearing the name ‘Roland Jones’. Hmm! This Mr Jones (Welsh?, the doctor wondered) was a polite sort of fellow. The box contained only a single object, a glimmer of ivory… he picked it up; a chess-piece. A knight, in fact, smooth and cold in his fingers – so smooth that it actually slipped from his grasp, and landed on the rug. As he bent down to retrieve it, a glint caught his eye – a letter, with a decorous gold trim, that had fallen and been kicked under the table – had he dropped it that morning, or had it been overlooked for days? He fetched it and smoothed it out before him.